Eduardo Halfon, Polish Boxer, Trans. by Daniel Hahn, Pushkin Press, 2012. The Polish Boxer covers a vast landscape of human experience while enfolding a search for origins: a grandson tries to make sense of his grandfather's past and the story behind his numbered tattoo; a Serbian classical pianist longs for his forbidden heritage; a Mayan poet is torn between his studies and filial obligations; a striking young Israeli woman seeks answers in Central America; a university professor yearns for knowledge that he can't find in books and discovers something unexpected at a Mark Twain conference. Drawn to what lies beyond the range of reason, they all reach for the beautiful and fleeting, whether through humour, music, poetry, or unspoken words. Across his encounters with each of them, the narrator - a Guatemalan literature professor and writer named Eduardo Halfon - pursues his most enigmatic subject: himself. Mapping the geography of identity in a world scarred by a legacy of violence and exile, The Polish Boxer marks the debut of a major new Latin American voice in English. The Polish Boxer*, a slim collection of linked stories by the Guatemalan writer Eduardo Halfon, is a revelation. Published by Bellevue Literary Press, it arrived practically unannounced this fall, only a whisper of notice perhaps in small presses and journals. But this is one of those books that will stop you in your tracks and leave you shaking your head in wonder. In this little jigsaw puzzle of a book, Halfon’s fictional fragments move effortlessly from Antigua, Guatemala, a cultural transit-point of Central America; to Durham, North Carolina; Belgrade and Póvoa do Varzim, Portugal. Narrated by “Eduardo Halfon,” a Jewish-Guatemalan writer and literature professor much like the author, these stories wrestle with issues of art and writing, identity, Auschwitz, sexual ecstasy, and Gypsy music, among other things. And they thrum with a kind of earthy Latin American braininess; Halfon’s is a relentless search for answers and secret keys to the riddles of life and family, history and home, truth and passion. The book really begins to soar in the third section, “Epistrophy,” in which the narrator encounters Milan Rakic, a half-Gypsy, Serbian pianist who is performing at an arts festival in Antigua. It is Rakic, “a modern nomad, an allegorical nomad,” who will lead this book in unexpected directions in two stunning chapters that follow. The first, “Postcards,” is a series of enigmatic snapshots on jazz and obscure Gypsy artists that Rakic sends to Halfon from his tours around the globe, as the classically trained musician becomes drawn ever deeper into the mystery of his own father’s roots as a wandering accordionist. And the second, “The Pirouette,” involves Halfon’s extraordinary search for the lost Rakic, who has disappeared into “his own damn myth” somewhere in the smoky Gypsy underworld of post-Communist Belgrade. The stories are cleverly, artfully, tied together—an American academic conference on Mark Twain (who happened to pass through Nicaragua in 1866); a literary symposium in Portugal, where Halfon ponders the vexed relationship between literature and reality; beachfront nights spent drinking, reading, and making love to his girlfriend, Lía, who afterward attempts to capture on paper the ebb and flow of her orgasms as if she were sketching waves or dreams. Anchoring all the musings and journeys, there’s the story of Halfon’s grandfather, saved from Auschwitz by his cellmate, a boxer from the same Polish town of Lodz, who over one long night coaches him on how to face an examination by the Nazi guards and survive. The Polish Boxer traces the lines of internal revolutions and the journeys of mind and body that inspire, ferment, and resolve them. Part novel, part collection of linked stories, Halfon takes the reader from his homeland of Guatemala, through a Mark Twain conference in the US, and onto an impossible search in snowy Serbia. At its heart lies a game of hide-and-seek as to whether the narrator and author – each named Eduardo Halfon – are one and the same. There’s also a grandfather who claims the numbers tattooed on his forearm are to ensure he never forgets his telephone number, and a classical pianist who disappears in search of the gypsy music he loves. How do our origins shape who we are? And what about our desire to construct identities: the stories we tell that can become more real than the truth? The Polish Boxer plays an elaborate and enjoyable game with all these ideas and remains fun and readable throughout. What’s more, its overall narrative is somewhat unreliable. This English translation takes a format that exists nowhere else in the world. It is a combination of several works by Eduardo Halfon that are brought together into one new book; its plot and themes are therefore as much a creation of translation as of authorship. Indeed translation is the quiet miracle of this book: five translators worked together on bringing it to English, yet it doesn’t feel in the least disjointed. I am yet to encounter a reader who can discern a seam in the writing. And the translation is elegant as well as thought provoking, though one wonders why – despite four of the translators being English – they opted for Americanised spelling. The Polish Boxer is a veritable feast of discussion points and thought provoking ideas, none answered, all which leave me with a smile on my face, feeling inspired and enthused. But then I love this sort of unspecific atmosphere. The Polish Boxer reminds me of Alexandar Hemon and Jonathan Safran Foer, not just in the experiences of immigration and journeys to eastern Europe, but in the mundanity of them, the drifting, the internal revolutions and the lack of focus. And like Everything is Illuminated, there is a sense that humour is used both as a way to effectively tell a sad story, and to shrink from truths too terrible to mention. Dichotomies. Grey areas. Nothing is certain. Internal revolutions are quiet and frequently reversed. ‘There’s always more than one truth to everything’ says Halfon at one point. Or often, there is no truth at all. Merely memory and perspective. This is metafiction about the necessity of fiction to describe and interpret reality. But can we trust narratives? Can we trust stories? Can we trust literature? Halfon is drawn to the idea that stories are tools through which reality is made bearable and intelligible. Yet he is equally aware that this romantic notion is incomplete and that coherence and narrative are inventions of literature that have little in common with everyday life. ‘Literature is no more than a good trick a magician or a witch might perform, making reality appear whole, creating the illusion that reality is a single unified thing.’The Polish Boxer is both self parody and a serious discussion of these issues. It begins in a classroom where students debate the merits of classic literature, particularly works where ‘nothing happens’ or the characters are dislikeable. Implicit comparisons are made with Mark Twain – that twisting, unpindownable clown - and they are somehow worthwhile. I’m not sure how Halfon manages not to make all this sound incredibly pretentious. Perhaps it is because he is far more overt in his humour and one doesn’t fully believe he is serious about anything. This isn’t a J.M. Coetzee play on fiction and biography where the wit hides in between words. At times it drifts into being slightly too self-referential, and Eduardo’s girlfriend Lia – a scientist who draws graphs of her own orgasms – is one of the few dud notes of the novel. Eduardo Halfon is the author of 11 books, but “The Polish Boxer” is his first to be translated into English, by, as it happens, five translators. This seems less a testament to the difficulty of the novel than a playful nod to one of its central preoccupations: how translation is a form of writing and writing is a form of translation. It is the sort of concern that can easily become ponderous in the wrong hands; in Halfon’s, it is funny and revelatory. If the first few chapters of “The Polish Boxer” seem like separate stories rather than parts of a whole, by the time Eduardo arrives at a cultural festival in Antigua the narrative threads are beginning to weave together. The Eduardo who takes in the drunk Guatemalan poets “telling jokes about queers and about Rigoberta Menchú,” a Venezuelan baritone “clucking incessantly about Chávez” and an Austrian quartet whose inseparable members fear “having to face alone the dangers of the third world” may delight in the risible globalism of contemporary life, but he also recognizes that what we adopt from elsewhere makes up who we are. He’s there, after all, to meet his girlfriend, Lía, who returned from a trip to Bahia “with a nickname for me like I was some midfielder on the Brazilian soccer team” — Dudú — as well as “with her pubis shaved smooth.” When the two emerge from their hotel room, it’s to attend the concerts of Milan Rakic, a Serbian classical pianist beneath whose renditions of Rachmaninoff you can hear strains of Thelonious Monk. This is less about unlikely harmonies than productive dissonances, the very kind the novel puts into play. There is, for instance, the matter of Eduardo’s Jewishness. The Polish boxer of the title refers to the man whose advice saved Eduardo’s grandfather from extermination at Auschwitz. Eduardo is captivated by the story, but otherwise wears his Jewishness uneasily, informing a beautiful Israeli backpacker he meets in a bar that he doesn’t feel Jewish. “Some people flee their ancestors, while others yearn for them, almost viscerally,” Eduardo notes over a meal with Milan. “I couldn’t get far enough away from Judaism, while Milan would never be close enough to the Gypsies.” But it is the Guatemalan Jew who turns into the seeker, prompted by a series of postcards from his half-Gypsy friend to find Milan’s traces in a snowy, postwar Belgrade. Milan had “adopted, as far as possible, the life of a nomad, but a modern nomad, an allegorical nomad, a postcard nomad, an ululating nomad in a world where being a real nomad is now forbidden.” The life of the quasi nomad is also, ultimately, Halfon’s own. 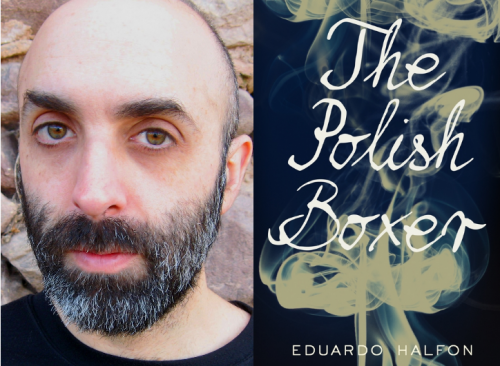 The Polish Boxer is the first work of fiction by the Guatemalan writer Eduardo Halfon to be translated in to English (by five different translators). The work sits at the crossroads between a short story, a novel and a memoir. It is narrated by a writer - Eduardo Halfon – who shares many biographical features with the real author. Both narrator and author are Jewish, educated in engineering, live in Nebraska, have been awarded a Guggenheim grant to ensure a sequel to the book, and teach at university in Guatemala. Are they one and the same person? Does it make a difference to the reader's understanding? This question remains open throughout the story. Ten loose units – potentially, ten short stories – magisterially blend in to one another to tell the story of the author/narrator's grandfather. He survived time spent in wartime concentration camps thanks to the Polish boxer whom he met in one. It is a story of friendship, fear of violence and self-enlightenment, narrated in a matter-of-fact and yet powerfully moving style. There is a sophisticated hide-and-seek game played by the author with the reader, which sees the plot submerge and re-emerge in an alternating rhythm. A number of characters frame the main plot, all independent thinkers who choose unconventional lifestyles. For example, Halfon receives enigmatic postcards from Milan Rakic, a Serbian gypsy pianist who forces him to search for clues and answers to his riddles – trying to connect several mysterious locations to the sender. Author and reader alike cannot help fall for the seductive game played by Milan, fascinated by his nomadic lifestyle: "a modern nomad, an allegorical nomad, a postcard nomad". The Guatemalan author Eduardo Halfon’s book The Polish Boxer is his first translation into English; presumably to honor this momentous occasion, Words Without Borders, which coordinated the translation, gave the book not one but five translators. The book is hard to classify. Reviewers are calling the book a novel, pointing you toward reading with a structure in mind. But The Polish Boxer is told in discrete stories that sit elegantly next to each other, connected, not exactly bound in a novel’s continuous arc. We read that a story always tells two stories. We read that the visible narrative always hides a secret tale. The story’s construction makes something hidden appear artificially, we read, and then I asked them if they’d understood it, any of it, but it was as though I were speaking some Bantu language. Silence. But rashly, undaunted, I stepped further into the labyrinth. Soon, we are led into stories that seem more continuous. Halfon tells a story of feeling out of place at an academic conference on Mark Twain — he envisions himself being thought of, in one instance of his trenchant but anxious ability to imagine himself from a borrowed perspective, as “some Latino revolutionary,” striking the delicate blend of feelings of insecurity and superiority. He can visualize this persona even as he struggles to present a coherent interpretive persona at the conference. Later, he says, “Sometimes, just briefly, I forget who I am.” Statements like this one hang at the end of paragraphs, weighing heavily into the spaces between. The title story, “The Polish Boxer,” is a story about Halfon’s grandfather, an Auschwitz survivor who used to tell his young grandson that the number on his arm was his phone number, tattooed so he wouldn’t forget it. Halfon’s grandfather was saved from certain death in Block 11 by a Polish boxer he meets, who tells him exactly what to say to his would-be executioners to have his life spared. “I used his words,” says the grandfather. References to this story appear throughout The Polish Boxer — for Halfon, it seems, there is some uncertainty as to how to think about this story, how to let it sit as a part of him, so pieces of it come up at different moments to be examined in the light of different circumstances. Our narrator’s search for Juan Kalel in the first story serves as a bit of foreshadowing. Later, Halfon meets a half-Gypsy pianist named Milan Rakić, a classical pianist tormented by his own love of the Gypsy music in his blood, who sends cryptic postcards to Halfon from his worldwide travels. When the postcards stop, Halfon ends up on the chase again, this time to Belgrade to look for his friend among the city’s trampled Gypsy population. So: Eduardo Halfon starts off teaching literature to a class of indifferent, obnoxious and smug students. Except for one, who, it turns out, is a very talented poet. Then one day he disappears, and Halfon travels into the middle of nowhere to find him. The poet is enigmatically quiet ("some smiles are not meant to be understood"), and the story ends in a kind of unstable equilibrium: the lessons of Joyce (circa Dubliners) and Hemingway would appear to have been learnt – at least by Halfon. The book is, among other things, an examination into the reliability or otherwise of literature. Halfon's grandfather tells him that his Auschwitz number is his phone number, used that way so he doesn't forget it; he then relates the story of a Polish boxer in the camp who told him what to say in order to survive – and we later learn that this might have been a fabrication. The Polish Boxer is a book that picks away at the idea of belonging as though at a scab; by which I mean to suggest that running all the way through it is a painful awareness of never quite fitting in, whether because of a state of mind, as in the case of Halfon's student, or because you are carrying within you the heritage of two antagonistic halves. Halfon has a Jewish heritage, but he rejects his religion; and the main story, from around the third chapter onwards (I use the word "chapter" loosely), is about Milan Rakic, a half-Serbian, half-Gypsy concert pianist who is rejected by the Serbs because he is part Gypsy, and by the Gypsies because he is half-Serb. A whole chapter is devoted to Rakic's postcards from around the world (this is very much a global book, travelling all over the place either in incident or background story), which all bespeak a great sense of isolation from his own family history: he is neither one thing nor the other. And in a similar way, the book itself exists in the no-man's-land between fiction and memoir. In the end, we decide, this is fable: only the stories are important, not their veracity or otherwise. The book dives into Gypsy culture, while all the while acknowledging that it is for all practical purposes impenetrable to the outsider. Only love can find a way in: and then that's it for the lovers, as far as acceptance by their own cultures goes. There is a romance, suddenly introduced towards the book's end, which makes you realise that Rakic's story is going to be repeated with another couple: and it is to Halfon's great credit that he does not belabour, or even draw our attention to, the comparison. The Polish Boxer traces the lines of internal revolutions and the journeys of mind and body that inspire, ferment, and resolve them. Part novel, part collection of linked stories, Halfon takes the reader from his homeland of Guatamala, through a Mark Twain conference in the US, and onto an impossible search in snowy Serbia. At its heart lies a game of hide-and-seek as to whether the narrator and author – each named Eduardo Halfon – are one and the same. There’s also a grandfather who claims the numbers tattooed on his forearm are to ensure he never forgets his telephone number, and a classical pianist who disappears in search of the gypsy music he loves. How do our origins shape who we are? And what about our desire to construct identities: the stories we tell that can become more real than the truth? The Polish Boxer plays an elaborate and enjoyable game with all these ideas and remains fun and readable throughout. The Polish Boxer is both self parody and a serious discussion of these issues. It begins in a classroom where students debate the merits of classic literature, particularly works where ‘nothing happens’ or the characters are dislikeable. Implicit comparisons are made with Mark Twain – that twisting, unpindownable clown – and they are somehow worthwhile. I’m not sure how Halfon manages not to make all this sound incredibly pretentious. Perhaps it is because he is far more overt in his humour and one doesn’t fully believe he is serious about anything. This isn’t a J.M. Coetzee play on fiction and biography where the wit hides in between words. At times it drifts into being slightly too self-referential, and Eduardo’s girlfriend Lia – a scientist who draws graphs of her own orgasms – is one of the few dud notes of the novel. Des Barry interviews Eduardo Halfon. I approach Eduardo Halfon to do an interview or article on him on the morning of the third day of his visit to the second annual Fiction Fiesta organised by Richard Gwyn of Cardiff University. Eduardo and I spend quite a lot of time in conversation over the weekend about his book The Polish Boxer. The fictional protagonist of The Polish Boxer is also called Eduardo Halfon. It’s hard to distinguish where fact ends and where fiction begins in the stories: whether the book is a collection of stories or a novel. ‘So you’ll intersperse what we talked about with observations about the book?’ Halfon says at our final dinner. The meeting. I emerge from the stairwell onto the roof of Coffee a Go Go and immediately I recognize Halfon from the photograph on the Fiction Fiesta website. Hard not to recognize him with his dark beard, glasses and shaved head. This rooftop party is the opening event of a dialogue among writers from Wales and Latin America and their translators. Halfon stands next to Tristan Hughes, a lanky, big-boned Welsh-Canadian novelist and academic. Tristan is six foot six and has a deep Welsh baritone. I shake hands with Halfon. He is slight, about five foot ten, in a dark coat that hangs over a pale jacket. Behind him, sunrays pierce the evening clouds and transfix the springtime city, light up the lead dome of the National Museum, the clock tower of City Hall, and the crenellated walls of Cardiff Castle. From this height, and in this light, the city behind him is shimmering. Halfon makes full eye contact, which reminds me of something that I miss since leaving New York – all those years back when I did a masters degree at Columbia – the openness of people from the Americas. Or is this a projection of mine? Halfon has written nine books in Spanish and his first translation into English, The Polish Boxer, has recently been published by Bellevue Literary Press in the United States and by Pushkin Press in the U.K.
Hughes, Halfon and I begin what, at first, seems to be a banal conversation about tobacco: the poetic sound of the name Golden Virginia, when it may be neither golden nor Virginia, then about the roughness of Old Holborn and Drum. But tobacco plays an important part in the life of Eduardo Halfon the protagonist of Eduardo Halfon’s book The Polish Boxer, who is not the author Eduardo Halfon but a kind of alter ego for the man standing before me. The Eduardo Halfon of The Polish Boxer smokes all the time. Many of the scenes in the book are wreathed in smoke. But the Eduardo Halfon in front of me on this rooftop doesn’t seem to smoke at all. The Eduardo Halfon of The Polish Boxer is a professor of comparative literature in Guatemala, and the Eduardo Halfon in front of me has been a professor of comparative literature in Guatemala. Halfon asks Hughes to make him a cigarette. He lights the roll-up but it soon goes out in the wind. Maybe he used to smoke. ‘You have an American accent,’ I say to Halfon. His accent to me has a New York flavour. Maybe that’s because of the Spanish inflections. For a moment we are joined by Sioned Rowlands, a translator. ‘I read that in Guatemala yesterday Efrain Ríos Montt was convicted for what happened during the dictatorship, in the early 1980s’ she says. A low rumble over the rooftop makes us look to the clouds for signs of storm. But other than the wind, the sky is calm. ‘Videla died today,’ I say. ‘The first story in the book alludes to that,’ I say. ‘How true is true enough?’ I ask him. The wind whips up and another thunderous rumble echoes around the rooftops. We search the sky for impending rain. Another roar, and we realise the rumble is coming from the speakers on the roof as the wind batters the microphones. It’s chilly up on the roof. Eduardo goes down the stairs to get a beer. I decide to leave. As I pass him on the stairs, we shake hands. ‘See you tomorrow, right?’ he says. On the walnut-panelled walls of the council chamber of Cardiff University, gowned and jowly portraits of men in suits, portraits of previous vice chancellors, put the hard stare on the audience of the Fiction Fiesta. It’s unnerving. Halfon is on a panel with Inés Garland, an Argentine novelist, and Richard Gwyn, novelist, poet, translator and essayist. The discussion covers some of the ground we ranged over last night but Richard is focussed particularly on translation. ‘Why did you decide to write in Spanish when your English is just as good?’ Richard asks. ‘The Polish Boxer is being translated into German, Portuguese, Italian, but in each country it’s being published in different formats,’ Richard says. Eduardo and I walk from the university down Park Place to Nick Davidson’s Coffee a Go Go to eat lunch. Nick hosted the first Fiction Fiesta last year, and is responsible for the gathering’s name. It captures the real sense of enjoyment in the dialogue among Latin American and European writers and translators. The sun on the city lights up the grey stone of the neo-gothic houses built by the medievalist architect William Burgess for the Marquess of Bute. Blossom drifts off the roadside trees in the warm wind. ‘Narrative and memoir, fiction and nonfiction, intersect in your work,’ I say. With so many people in the café, lunch takes a long time to arrive. ‘So is the book a collection of stories or a novel?’ I say. ‘What do you think?’ Eduardo says. We sit around the table at my house for a final dinner: Richard Gwyn, Eduardo and myself. ‘Will there ever be a final edition of The Polish Boxer?’ Richard says. Born in Guatemala in 1971, Eduardo Halfon came to the United States when he was ten years old. He studied Industrial Engineering at North Carolina State University and moved back to Guatemala in his early twenties, taking a job in that field. But the difficulties of working a job that he says, “wasn’t really me,” in a country that was no longer his own, while speaking Spanish—a language that he had “basically forgotten”—left him frustrated. In the process of searching for answers, when he was in his late twenties Halfon took a course in literature at a local university and became avidly, irrevocably interested in reading. As a side effect of his newfound bibliophilia, Halfon eventually started writing. Now, at the age of 41, his literary career is in bloom. Aside from being recognized in 2007 by the Hay Festival of Bogotá, Colombia, as one of the best young Latin American writers, Halfon has published ten works of fiction in Spanish. They include: La pirueta (2010), winner of the José María de Pereda Prize for Short Novel, El ángel literario (2004), an attempt to trace the literary origins of writers, and El boxeador polaco (2008), which was published in English this year by Bellvue Literary Press in the U.S. and Pushkin Press in the U.K., as The Polish Boxer. The Polish Boxer is voiced by a narrator (also named Eduardo Halfon) who tells fragmented stories about searching for things—a missing student, the truth about his grandfather’s tattoo from Auschwitz, a mysterious Roma pianist named Milan—in a narrative that travels from a university in Guatemala to a literary conference in North Carolina to the streets of snowy Belgrade. Populated by people both real and imagined, the book flashes by like a disquieting dream. Tonally, much of this ten chapter work is elusive, autobiographical, and resists categorization. When Halfon and I first talked via Skype in October he had just returned to Nebraska, where he currently lives, from a ten-day book tour of London and New York for The Polish Boxer. After he took another trip to New York with one of his translators, we spoke again in December, just as he was finishing up a new manuscript. In this interview, Halfon, a man who always seems to be jumping across borders, discusses the characters in his last publication, the music in his writing, his feelings of nomadism, and why he is reluctant to distinguish himself from his eponymous narrator. Lets talk about The Polish Boxer and its personal consequences. In the chapter “A Speech at Póvoa” you write about how difficult it was to find a way to properly tell your grandfather’s story of survival in Auschwitz. Can you talk about how that journey played out for you? If you go back to a book I published in 2004 called El ángel literario (The Literary Angel), there’s a scene where I explain to the Spanish writer Andrés Trapiello that I’m carrying my grandfather’s story under my arm, but that I don’t want to tell it. That was four years before The Polish Boxer came out in Spanish. So I lugged this story around for a long time, afraid to tell it, unwilling to tell it, not knowing how to tell it. Still, it would come out everywhere because it was an intimate part of my family and my life. That story is the centerpiece of the book. The Polish boxer himself—the character—is a figure that is barely present, or not present at all. Yet he is. He’s like a specter, or like a breath that permeates the book. Something that you can’t point to, that you can’t really see, but that you can feel. And that’s what my grandfather’s story was to me. It was this huge story that was barely present. Eduardo Halfon reads an excerpt about his grandfather from The Polish Boxer at Pacific Northwest College. In the book Halfon says his grandfather always told him that the tattoo was his phone number. So, it’s emotionally intense when he finally explains that it was a mark of his time in Auschwitz. You have said in other interviews that this is actually autobiographical. Was it freeing to finally write this book? It wasn’t an emotional trip for me. None of my books are. For me, they are not releases, or ways of coming to terms with things, or of understanding the world, or of feeling better about a situation. I never feel better after writing a book. I never feel as though I’ve come to understand something. I just keep writing. And writing, for me, is never an ending. I don’t arrive. I keep going. I have to keep going. Was your grandfather able to read the book while he was alive? The book was published in Spain in 2008, and he died in 2010. My mother said she read it to him, and he cried the entire time. I don’t know how much he understood—he was elderly and very ill, almost senile towards the end. Perhaps he cried because he knew that his story would survive him. Or at least that’s what I like to think. In the last chapter of The Polish Boxer I write his deathbed scene. An interesting side note to this, which I decided to leave out of the story, is that when I went to his room on the morning that he died, there, sitting on his nightstand, was a copy of El boxeador polaco. Now I would like to know more about Halfon, the writer. Were you always this rational about your emotions? I never cry. I’ve cried two times in the past twenty years, and both times have been over cats. Yet I feel like crying all the time. I appear to be a very rational, methodical person, but that is really a façade, isn’t it? There is this duality in me between the irrational and the rational, between the emotional and the structured. Maybe that is the reason why I felt so safe when I played music, as a child and teenager, because in music you can be both, you have to be both. And in my type of writing, I have to be both, as well. There are many dualities in your life. It’s really difficult, for example, to assign you just one identity or set of roots. Do you ever consider yourself a citizen of a particular country? Not at all. It’s a constant feeling of being outside, of wanting to be outside. It’s not a choice. I’ve just never felt that I belonged anywhere—not in Guatemala, not in the United States, not in Spain. I don’t know why that is, but it’s my reality. It’s a very fluid existence. I can pretend to be where I’m at: I’m very American if I’m in the U.S., and I’m very Guatemalan if I’m in Guatemala, and I’m very Spanish in Spain. I can modify my voice and my physical appearance and pretend to be from where I’m living at the moment. Yet I’m not really there. Before you became a writer, you were an engineer. Does that methodical occupation affect your work? I was an engineer way before I studied engineering. I am very systematical, very organized, very methodical, almost to neurosis. When I write I am very much an engineer of language, and also an engineer of the story itself—the structure, the characters, the order in which to tell it. But my writing is also spontaneous. When I start I don’t know if I’m writing a page, or a hundred pages, or nothing at all. But it’s not that I do some sort of Dadaist, freeform writing and then the other part comes and corrects it. No. The tricky bit is for these two sides of me to get along, to know when it’s time for the spontaneous, free part of writing, and when it’s time for the structural part of writing. It’s like learning a new dance. Lets talk about your spontaneous/methodical writing. Something that also stands out is your ability to interrupt a story to pursue an unexpected tangent without being disperse. Those interruptions can’t be gratuitous, though. There has to be something there that takes you somewhere as a reader. In the story “The Polish Boxer,” for example, at the height of my grandfather’s narrative, I suddenly break into a childhood scene where I ask my mother where babies come from. As I was writing that scene, I myself was confused. Why was I doing it? I knew that that wasn’t the way a story is supposed to be written. But I also knew, or felt, that it was right. Later, I understood why that flashback, at that moment, made the scene work. Of course, that’s not the way you write a story, according to those who know. But I don’t care about them. I just care about the story. Is that also a strategy to maintain your reader’s attention? The feeling of the rug being pulled out from under you is important in my writing in general, and particularly in The Polish Boxer. At some point you shouldn’t know what to expect anymore, and that’s exactly what I want. You don’t know if what you’ve read is an ending or a beginning, if in the next page I’m going to contradict what I just told you. For me, it’s important to keep the reader on guard, always a little uncomfortable. That element of slight discomfort is very important in short story writing, and in my writing in particular. I appreciate that you say that. For me, as a reader, a constant discomfort was trying to understand the difference between Halfon, the character of The Polish Boxer, and Halfon the writer. How do you draw a line between those two entities? I don’t. Part of the intention is lulling the reader into thinking that both Halfons are the same person, that what they’re reading is absolutely real, and not fiction. In doing so, I want to create an emotional response, similar to what a musician would do through music. I’m always going back to music. Music is the only art that needs no rational mediation—it either goes straight in or it doesn’t. There’s a strong lyrical component to what I write—in beats, repetitions, the words themselves—and that’s very tricky to achieve, and almost impossible to fix when it’s not there. And in this process, how much do you value silence? Silence is key. There’re two types of silence: the external, which is marked by interruptions or street noise; and the internal silence, the internal calmness that I need to write. For me, both of these are key. Can you tell us something about your new novel? It’s called Monastery, and takes place in Israel. It grows out of The Polish Boxer. It’s part of that same universe, part of those same stories and characters and preoccupations. As I was telling you earlier, there are no endings. I just keep writing. Guatemalan author Eduardo Halfon is this week's Alt.latino guest DJ, and he's a natural choice; his new book, The Polish Boxer, is a series of semi-autobiographical stories woven through with loving references to jazz and classical music. "In my favorite story, Professor Halfon searches throughout Guatemala for Juan Kalel, a brilliant indigenous student who mysteriously dropped out of school. When he finally finds Kalel, they start talking about their mutual love of poetry: 'Do you know, Halfon, how to say poetry in Cakchikel? Juan asked suddenly ... Pach'un tzij, he said ... Do you know what it means? he asked, and although I hesitated, I said no... Braid of words, he said.' "
We thought we'd ask Halfon a few questions about literature and the important books in his life. What was the first book you read that made you fall in love with literature? I was 8 or 9 years old when I read Charlie and The Chocolate Factory, by Roald Dahl. I read it for school because I had to, because only the students who'd read it would be allowed to see the movie. I remember that it was screened in a small classroom, made dark by thick black drapes hung on the windows, and the girl I liked or maybe loved was sitting right next to me. To impress her as we watched Charlie and Grandpa Joe and old Slugworth, I proceeded to remove a tiny scab from my elbow and let the wound bleed in the dark. She, of course, noticed nothing. My first book was also my first fiasco at love. What should people read to better understand your work? I'd like to think that the windows to my work aren't so much in other books, but in the films of Bergman or Kiarostami, in the music of Monk or Dylan, in the ever-moving yet balanced mobile sculptures of Calder, in the childhood game (always the most serious ones) of hopscotch. What were you reading, if anything, while you wrote The Polish Boxer? The Polish Boxer was written slowly, over many years. And, actually, is still being written now. I'm still writing it. I haven't finished it. Perhaps I'll never finish it. I've just written three new stories or episodes, for instance, which belong to that series, to that narrator's quest, and which will be included next year in the Brazilian and Italian editions of the book. So every story I read, every film I see, every song I discover, finds its way onto my pages, one way or another. And my pages are never final. What books or authors would you recommend to help readers understand Guatemala better? One of the most important Guatemalan novels of the last few decades is Time Commences in Xibalba, written by Luis de Lion, a Kaqchiquel Maya who used Spanish as his literary language. In 1984, Luis de Lion was kidnapped by the military forces governing the country, tortured during 20 days, and then assassinated — information that only came to light 15 years later, in 1999, when his name and the details of his murder appeared in the so-called "Diario Militar," a secret military document which lists the Guatemalans who were "disappeared" by the military forces between 1983 and 1985. In that list, Luis de Lion is number 135. His novel — as beautiful, sinister, hideous and violent as Guatemala — was published posthumously. If you were sentenced to a desert island for many years and could take one book, which one would it be?